Stay at the Riu Santa Fe in lovely Los Cabos, Mexico, an alluring, popular destination with a charming, rustic Santa Fe atmosphere offering all-day meals and snacks. Room amenities include a mini-bar (re-stocked daily), liquor dispensers, air conditioning, satellite TVs, safety deposit boxes, Wi-Fi access, and amenity kits. Receive extra pampering with the Riu-topia package, rolling out the royal treatment for the duration of your stay. Break a sweat in the fully-equipped fitness centre, play a round of golf at a nearby golf course or rejuvenate yourself with first-class luxury spa treatments. Sink your teeth into international and local delights at any of the specialty restaurants or sip margaritas at the pool bar. 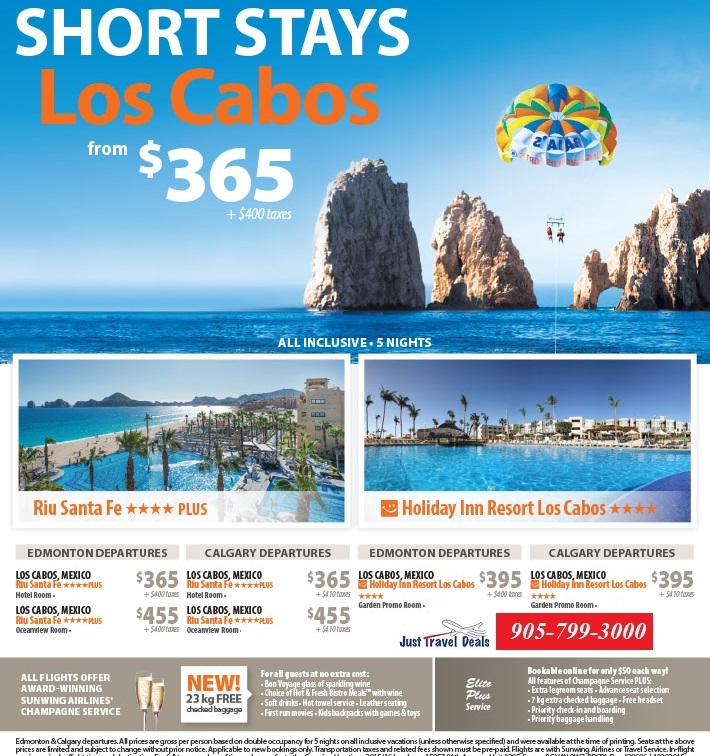 Retreat to the all-inclusive Holiday Inn Resort Los Cabos in Mexico and experience nature at its best. Situated next to a bird sanctuary, natural lagoon and nature reserve, this Mexico hotel is the ideal place to enjoy the peace, tranquility and natural beauty of this unique region. Take time to enjoy the Orchard Tour, or participate in the Turtle Release program, which provides you with a once-in-a-lifetime opportunity to get involved with the preservation of local sea turtles. With a kids club, a range of international and local cuisines to feast on throughout the day, and a variety of bars for mingling, Holiday Inn Resort Los Cabos is a relaxing, natural paradise. Ideal for families, this resort offers an array of services such as babysitting, arts & crafts, a playground area, and all sorts of games. The opportunities for fun in the sun and sand are unlimited! Don't miss out on Holiday Inn Resort Los Cabos’ theme parties, tennis courts, nearby golf, a honeymoon bonus, non-stop daily activities and more!